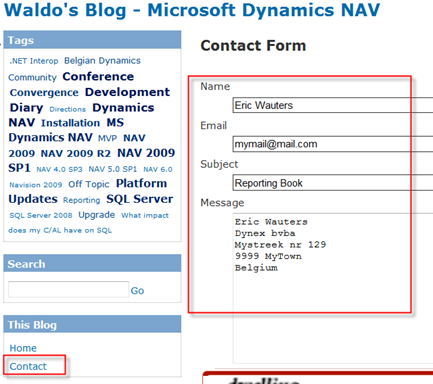 Waldo's Blog - Microsoft Dynamics NAV NAV 2009 "Professional Reporting" book: Contest & Promotion! 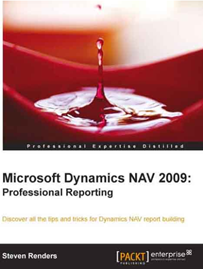 NAV 2009 "Professional Reporting" book: Contest & Promotion! First of all, you can win 3 hard copies of the book. However, I'm only able to send print copies to an address in the US and Europe only. I don't really know why .. but that's what I've been told. Second, everybody can win 3 e-copies of the book. No "however" here .. everyone can win this :). Friday the 4th of November, this little contest will end! I'll put the winners in a separate blogpost. But that's not all ..
On top of the above .. everyone can benefit from a promotion .. just because you're reading my blog :-) (although I do think this promotion will be printed on some other sites as well .. but hey ;°) .. for me, you're special :-) ). When ordering a copy, if you fill in the promotion codes below .. you will get an 18% discount on what you order! How cool is that! This promotion is valid from 1st till the 20th of November. So be quick (enough)! As I already mentioned .. this book is a "must read". Don't hesitate to take a shot at the above. you're absolutely right .. and I'm so ashamed! :-/. I updated the mailadress - didn't know it was still configured in my blog. If any of you want to participate .. please do so by providing your details again :-/. The e-mail address you entered couldn't be found. Please check the recipient's e-mail address and try to resend the message. If the problem continues, please contact your helpdesk."